An original letter of correspondence between Joshua Coffin Chase and J. E. Bona. 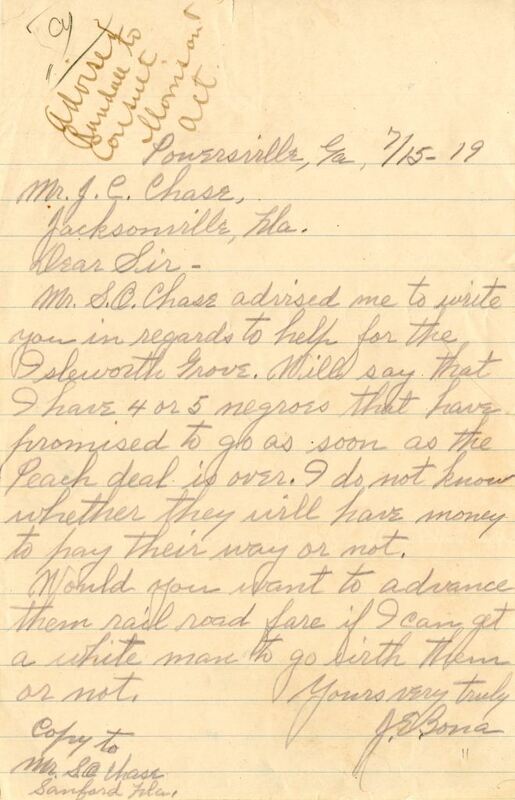 Topics discussed in the letter include a request for Chase to advance pay for a group of African-American laborers at Isleworth Grove so that they could leave via railroad, with the accompaniment of a Caucasian laborer. Original letter from J. E. Bona to Joshua Coffin Chase, July 15, 1919: box 49, folder 20.84, Chase Collection (MS 14), Special and Area Studies Collections, George A. Smathers Libraries, University of Florida, Gainesville, Florida. Digital reproduction of original letter from J. E. Bona to Joshua Coffin Chase, July 15, 1919. Mr. S. O. Chase advised me to write you in regards to help for the Isleworth Grove. Will say that I have 4 or 5 negroes that have promised to go as soon as the Peach deal is over. I do not know whether they will have money to hay their way or not. Would you want to advance them rail road fare if I can get a white man to go with them or not. Chase, Joshua Coffin. 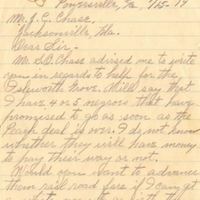 “Letter from J. E. Bona to Joshua Coffin Chase (July 15, 1919).” RICHES of Central Florida accessed April 19, 2019, https://richesmi.cah.ucf.edu/omeka/items/show/2754.